Skulls are switches that can be activated to tweak campaign gameplay. They are available in every Halo campaign, and Halo 4’s Spartan Ops. Many Skulls have an effect on your final point tally in Campaign Scoring. Others will disable Campaign Scoring entirely, and are just for fun. Bandanna: Infinite ammo and grenades. Where’s the bandanna? Under your helmet of course. Black Eye: Your shields will only recharge after you melee an enemy. Why? Magnets. Boom: The damage radius of explosives is doubled. This also affects chain-reaction explosions! Eye Patch: Aim assist is disabled for all weapons. You’ll miss it when it’s gone. Famine: Dropped weapons have half the ammunition. The Feast Skull was cut. Fog: Your motion tracker is disabled. Foreign: You cannot pick up or use Covenant weapons. Grunt Birthday Party: Landing a headshot on Grunts will release confetti, cheers, and invisible rainbows. Grunt Funeral: Grunt bodies explode like a Plasma Grenade. Methane + ? = Boom. Iron: Dying in solo play forces you to restart from the beginning of the level. In co-op, if any player dies you all are sent back to the last saved checkpoint. May result in damaged friendships. Malfunction: A HUD element will disappear at every respawn. Mythic: All Covenant enemies have twice the health, and Sentinels are given energy shields. Pinata: Punching enemies will cause grenades to drop. Don’t think too much about where they were stored. Recession: Every shot uses two ammo. It’s simple Halonomics. Anger: Enemies fire weapons much more aggressively. The Covenant discovered they have infinite ammo, and they want to show off. Assassins: All enemies are cloaked. Covenant Ninja Academy, class of 2552. Bandana: Unlimited ammo and grenades. You must wear a bandana in real life. Blind: Your HUD disappears and your weapon does not display. The perils of being made by the lowest bidder. Boom: All explosion physics impulses are increased. Glorious science! Black Eye: Your shields will only recharge after you melee an enemy. Perk up your shield’s spirit by dispensing two-fisted cyborg justice. Catch: Enemies throw more grenades. Down in front! Envy: The Chief has Active Camo and the Arbiter gets a flashlight. Not fair! Eye Patch: Disables auto-aim. We recommend adjusting your controller sensitivity. Famine: Dropped weapons have significantly less ammo. Budget cuts. Feather: All melee strikes impart additional force. Pow! Fog: Your motion tracker is disabled. Keep your eyes sharp. Foreign: You cannot pick up Covenant weapons. Union rules. Ghost: Allies and enemies no longer flinch, meaning they shoot more often. No pain, firepower gain. Grunt Birthday Party: Grunt headshots release party favors. ‘Nuff said. Grunt Funeral: Grunts explode after death. Oh, the humanity! Iron: Don’t die. Playing solo you have to start the mission over. In co-op you’re all sent back to the last checkpoint. IWHBYD: Rare dialog is more common, and vice versa. Did he really just say that? Jacked: You can only pilot a vehicle by hijacking it. Video games made you do it. Malfunction: Each death removes a random element of your HUD. You didn’t want that shield indicator anyways … right? Masterblaster (Co-Op Only): One player has recharging overshields and can only melee. The second player has no shields, but infinite ammo. Roles switch after a random number of kills. Who runs Mombasa-town? Mythic: Enemies have increased health and shields. Covenant forces have been bulking up. Pinata: Enemies drop a plasma grenade when you hit them with a melee attack. Smack, shield crack, and grenade pop. Prophet Birthday Party: Every smack to the Prophet of Regret’s face is accompanied by epic Steve Vai guitar licks and lightning bolts. Recession: Every shot uses two ammo. The ammo usage has been altered, pray we don’t alter it further. Scarab: All player-held weapons fire the Scarab Gun beam. Unlocked when you find all the original Halo 2 Skulls. So … Angry …: Enraged Brutes will explode shortly after enraging. The secret is, they’re always angry. Sputnik: Mass of all objects is reduced. Combine with Boom and Feather for maximum enjoyment. Streaking: Your shields constantly decay, but recharge a bit after each enemy kill. There’s an invisible energy vampire stuck on your back. His name is Ed. Swarm: Let go my golo! Hunters are even more robust and deal extra damage with attacks. Unlocked after you watch all five episodes of Halo: Nightfall on the Halo Channel and complete the associated challenges. That’s Just … Wrong: Enemies have a cyborg-detecting sixth sense. They Come Back: Infection Forms that reanimate a corpse are much stronger than normal. Clean up any bodies before that happens. Thunderstorm: Field promotions for every enemy in the Chief’s path. 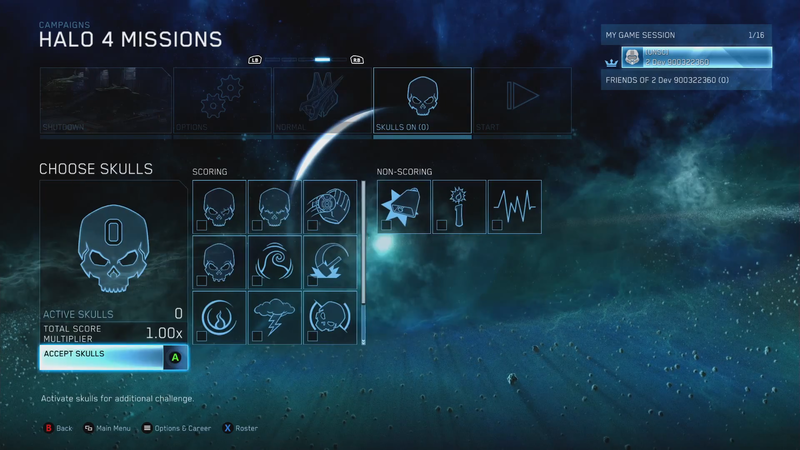 You do not need to find the hidden Halo 3 Skulls to unlock them in The Master Chief Collection. Black Eye: Your shields will only recharge after you melee an enemy. Blind: Your HUD display is disabled. Count your bullets. Catch: Friends and foes throw – and drop – more grenades. You’ve been warned. Cowbell: Physics impulse of melee and explosions is increased. You wanted more, you got it. Famine: Dropped weapons have half the ammunition. Grunt Birthday Party: Landing a headshot on Grunts with a precision weapon reveals their skull contained confetti and cheers. Hurray! Iron: Dying in solo play forces you to restart from the beginning of the level. In co-op, if any player dies you all are sent back to the last saved checkpoint. IWHBYD: Rare dialog is more common, and vice versa. Some things just can’t be un-heard . . .
Mythic: All Covenant enemies have twice the health and shields. Thunderstorm: Enemies are promoted to the highest rank. You’ll also encounter more shields on Flood Elites and Sentinels. Tilt: Enemy resistances and weaknesses are amplified. For example, shields and armor take more damage from plasma, but are further hardened against projectiles. Tough Luck: Enemies will evade grenades and projectile attacks more skillfully. Brutes and Grunts are significantly more reckless when their backs are to the wall. Black Eye: Shields don’t recharge unless you melee enemies. Biff! Kapow! Blind: Your HUD display is disabled, and your first-person arms and weapons are invisible. Catch: Enemies throw more grenades. Take cover! Cloud: Your motion tracker is disabled. Cowbell: The force of explosions is increased. Grunt Birthday Party: Headshotting hapless Grunts results in a HAPPY BOOM TIME! Iron: Solo – Restart mission on death. Co-Op – Back to previous checkpoint on death. IWHBYD: Rare combat dialog is more common. Mythic: All enemies have increased health. Thunderstorm: Enemies are promoted to the highest rank. Specialists, such as Rangers and Zealots, are not promoted. Tilt: Resistances and weaknesses are amplified for yourself and enemies. Tough Luck: Enemies will never flee, will berserk at the slightest aspersion to their parentage, and dodge projectiles with the greatest of ease. This entry was posted in Halo 2 Anniversary, Halo: The Master Chief Collection and tagged 343 Industries, Castle Map Pack, Halo, Halo 2, Halo 2 Anniversary, Halo 3, Halo 3 Halo: The Master Chief Collection, Halo 3 Master Chief Collection Campaign, Halo 4, Halo Skull List, Skulls, Xbox, Xbox One by Chief Canuck. Bookmark the permalink.